Mouse is a stack-based interpreted programming language descended from MUSYS, an earlier language for a DEC PDP/8 with 4096 words of memory. 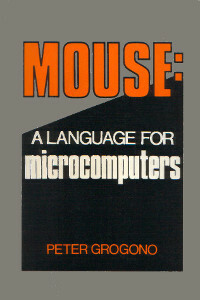 In Mouse: a Language for Microcomputers, Grogono defines the language and develops an intepreter step-by-step as he introduces each feature of the language. The first few chapters cover the basics: postfix expressions, variables, control structures, pointers and macros. Later chapters include two complete Mouse interpreters, one in Pascal, the other in Z80 assembly language. Here's a brief summary of the Mouse language. Instructions pop their operands from and push their result on the stack. ( before -- after ) shows the stack effects of each operation. [ … | … ] is similar to Forth's IF … ELSE … THEN. Macros are the Mouse equivalent of subroutines. A macro is defined by $x … @ and called with #x;. Parameters can be passed between the macro name and semicolon. For example #x,7,5,9; will pass the parameters 7, 5 and 9 to x. A macro accesses it's parameters using %: 1% for the first, 2% for the second, etc. A parameter is evaluated every time it's accessed and can be almost any valid Mouse code. A macro has 26 local variables, A to Z. 26 macro names are available, A to Z. Displays the string Hello, World. The exclamation mark isn't printed. An exclamation in a string instructs the interpreter to print a line break. All Mouse programs end with $. F calculates Fibonacci numbers using the recurrence relation Fn = Fn-1 + Fn-2 with F0 = 0, F1 =1. Note this is really slow, Ο(φn). Calculating F40 takes 6 minutes. There are better ways to calculate Fibonacci numbers! Another example of recursion. G calculates the GCD using Dijkstra's method. Grogono, Peter Mouse: A Language for Microcomputers . New York: Petrocelli Books, 1983. David G Simpson has published several interpreters for Mouse. I think you meant LISP is PREfix. This is a stack based language, therefore postfix/RPN should be expected. I would rather use a professional programming environment, made for professionals to create reliable fast professional code. You should use Visual Basic.